To wake her I picked her up and sat her on the couch. She was so not amused. I wish I slept that deep! 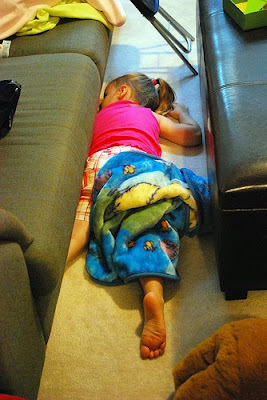 No kidding!...she is the exact opposite of me - the lightest sleeper ever! Today she fell asleep just before dinner and I didn't want her to sleep so I started throwing stuffed animals at her and she kept sleeping!!! I was thinking the same the other day! lol!